School is out for summer!, between college and High Schools our youth will be free from the inhumane treatment they have endured this past year for new freedoms. Let them celebrate now but soon they will learn what we as parents have been trying to tell them for years. It’s a cruel world we live in. Hard work and perseverance will get them that job that they have always wanted and the big bucks they so want. We as parents will be right behind them catching them and steering them in the right direction. So congratulations to those seniors and good luck on your new ventures. Inspection reports have been flowing into my mailbox and I thank all those hard working Granges and Pomona Granges who have welcomed my Deputy staff into your Grange Halls. I have seen we have Community Granges that are having a stressful year with weather and lack of new members. There is help from our membership committee for programs and supplies for new growth. Many Granges are going to farmer markets to seek new members. It seems we can’t get them to our meeting places so we must go to where they go and ask them to join. 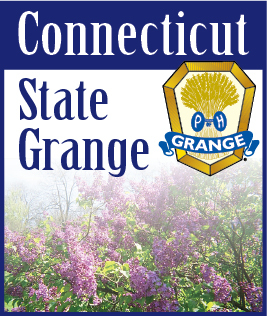 Many events are happening in June, “Let’s Celebrate” and Grange Sunday is June 14th with CWA contest judging on June 13th, at Cheshire Grange Hall. Hope to see you there to root on the talent contest entries after the Youth Committee luncheon. June 28th is New England Grange Sunday at the Cathedral of the Pines, in Rindge NH. Let’s take a day trip to the woods with fellow Grangers. In the Blue Book the Agriculture Contest is incorrect, this year we are continuing the donations of vegetables to Soup Kitchens, Shelters, Food Pantries, and Food Share. Last year you donated over 13,000 lbs of vegetables to these groups and we are seeking 15,000 lbs this year. So get planting there is still time to get plants into the ground. I would like to thank Kathryn Ruff for her time as deputy of East Central Pomona #3, during her recovery of knee surgery we had a lack of communications and she asked to step down. This is one is on me because I do not read e-Mails of the President as often as I should and lost a faithful member from my staff. For this I am greatly sorry. As Elections for some Granges are in June remember that we are all team players, and individuals have no place in our order, let’s all work together for the next Grange year.